“What is this pose good for?” is one of the most frequently asked questions in the yoga class. “Find out for yourself. Experience the pose while you are in it,” is a tempting reply. When you know beforehand what to expect, then you are pinned to that and miss your own overall impression. Shoulderstand belongs to the group of inverted poses – those poses where the head is downwards and the legs upwards. 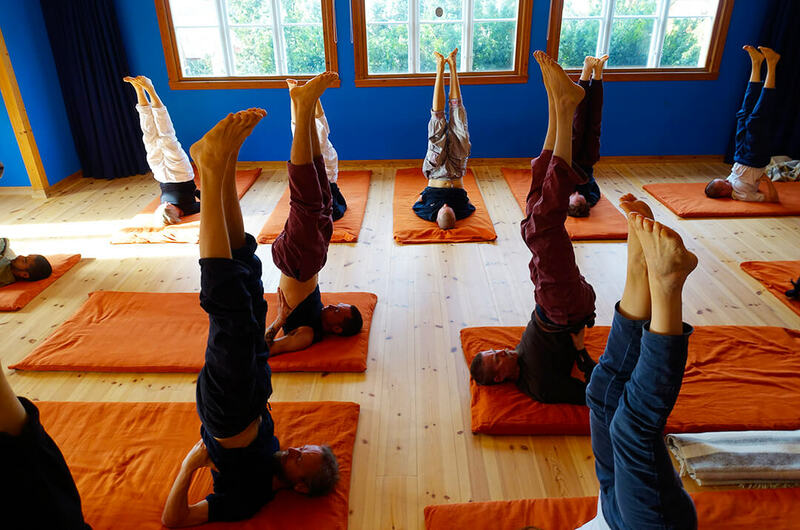 In the article on headstand, we mentioned how the inverted poses increase oxygen intake and facilitate the blood’s return flow to the heart, which is thereby relieved. We described how the increased blood supply to the brain gives nourishment and oxygen to the cells and tissue, and how the abdomen, intestines and inner organs are relieved as they now hang inverted. What is special about shoulderstand is that while the body is inverted, the throat and head are bent in the so-called chin lock. This raises the blood supply to the entire upper part of the body and stimulates the glands in that area, in particular the thyroid gland in the throat, which has to do with the hormonal balance and the cells’ metabolism. A healthy thyroid gland leads to healthy functioning of the body’s organs and blood circulation. Moreover, it has been shown that shoulderstand definitely benefits the breath, and for asthmatics and people with bronchitis, it can be an invaluable supplement to treatment. For a normal cold, the shoulderstand can alleviate the symptoms and accelerate the healing process. We shall also see how shoulderstand helps with certain injuries of the throat and neck resulting from traffic accidents. But first and foremost, it has a harmonizing effect on the whole body, giving mental balance, strengthening the constitution and preparing the body for meditation. Lie on the back, on a mat or a folded blanket, and calm down. Slowly raise the legs off the floor and tilt them over the head so that the back lifts up from the floor. When the back is in a vertical position, support it with the hands and forearms. The palms press against the back as close to the shoulder blades as possible, and the elbows are on the mat, a shoulder width distance apart. In this way, the torso remains upright while you straighten the legs vertically. Now, the body is standing as straight as a “candle”, as some also call this pose. But the head is bent and the chin touches the chest. When first coming into the shoulderstand, you sometimes experience a certain restlessness in the body and a desire to come down again at once. But if you remain in the pose a little longer, restlessness will disappear, replaced by a deep calm, a desire to stay and just rest in the pose. Therefore, give the body a little time and experience how it is to be completely motionless in the pose – ½-1 minute to start with. Thereafter, gradually increase the time to 5-10 minutes and remain standing until you have felt calmness in the body for some time. Our own experiences are confirmed by some research described in the journal Yoga Mimamsa no. 1 and 2 from 1926. In shoulderstand, the blood pressure increases slightly coming into the pose, which is natural considering the movement involved, but decreases again and normalizes after 2-3 minutes. After coming out of the pose, the blood pressure falls for a while to a little below normal. This signifies that the blood pressure is made more flexible and that the exercise together with other classical yoga poses prevents a permanent high or low blood pressure. People also recount that when, for instance, after a sickness or an operation, their blood pressure is a little high and will not go down again, then it normalizes when they resume their yoga practice. Ordinarily, one inhales and holds the breath when coming into the pose. Thereafter, you breathe normally; if you want to deepen your state in the pose, then concentrate on the normal breath. When you have used the shoulderstand for some time and know the peace that emerges, you can occasionally intensify the effect further by holding the breath for periods. This has a mental effect, and can help with colds: after having calmed down, inhale slowly and deeply and hold the breath as long as is comfortably possible. Breathe slowly and carefully out again. Let the breath calm down. Repeat the entire process a couple of times more while staying in the pose. Before you come out, inhale again and hold the breath – lower the legs and body slowly down to the floor. Then lie still and relax. Shoulderstand belongs to the sequence of yoga poses we call the classical programme. Here it comes after the headstand (and the palm – where for a moment you stand on your feet – ) and before the plough, and these poses supplement each other perfectly. After headstand, one more swiftly acquires the calmness in shoulderstand and its effects are enhanced. After being in shoulderstand, it is natural to lower the legs down over the head into the plough and thus increase the stretch on the back side of the body. In the counter pose, the fish, one lies on the back with the legs in the lotus pose, taking hold around the toes with the hands (in an easier variation of the fish, the legs are straight and the palms are placed under the buttocks). The chest is raised while the head is bent backwards, resting on the crown. For a further introduction to the classical programme, and to different variations and the use of chakras as areas of concentration, we recommend Swami Janakananda’s book, Yoga, Tantra and Meditation in Daily Life. One of our students earlier had problems with the thyroid gland and the metabolism. At the time she started attending yoga, it was so severe that she was scheduled to be operated. She learned shoulderstand and continued to use it regularly every day, and after a period of three months the production of hormones became so normal that it was no longer necessary for her to be operated. Now, one example does not prove anything, you could say. But the fact that the shoulderstand’s beneficial effect on the thyroid gland, by regular and systematic use, is described in the yoga literature, confirms the general value of this story. Not just our own and our student’s personal experiences with shoulderstand, but also research of yoga and meditation shows how effective the pose is. Doctors Udupa, Singh and Settiwar, of the Institute of Medical Science in Benares, India, researched in 1975 the effects of six months regular use of shoulderstand (together with the counter pose the fish) and compared the results with similar tests of the headstand and the plough. It was confirmed that shoulderstand stimulates the body’s glands and metabolism, and the research especially underlined the physiological effects on the blood circulation and the respiratory system. The ability to hold the breath is improved and the girth of the chest is enlarged, giving a greater vital capacity (the volume of air exhaled after a full inhalation). The researchers’ study show that the lungs, in the course of the six months, became capable of inhaling up to 25% more air, or about a litre more per breath – and thereby take in more oxygen. 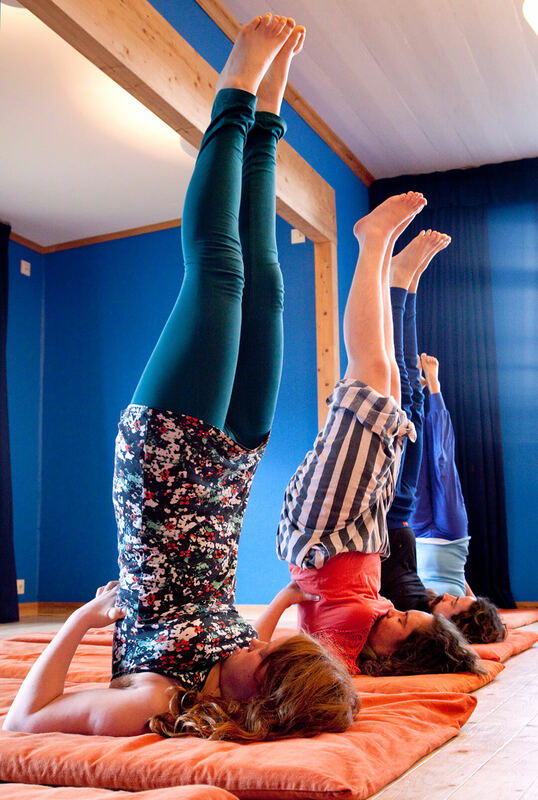 According to several sources, shoulderstand purifies the blood (Swami Satyananda, Swami Narayanananda, et al.). We must conclude that, among other things, it is due to the increased oxygen intake that supplies the lungs and therefore, the blood while standing in the pose. Through this training of the lungs, the respiration generally improves. Shoulderstand (and the fish, where the chest is expanded and the throat stretched) therefore, is an important pose for one who wants to achieve that harmony which is defined by yoga, and which forms the basis for real success with advanced yoga and meditation. On the basis of this research, together with our own experience, we can conclude that the shoulderstand contributes to the alleviation and prevention of common respiratory problems for people suffering from asthma and bronchitis. “When I feel bad, I can’t do shoulderstand properly, it is too much of an effort, but there is absolutely no reason to give up! I lie on my back, bend the legs, roll up on to the shoulders, stretch out into the correct posture with support from the elbows and remember to do a thorough chin-lock. I stay as long as I can and roll out in the reverse order. Often the pose must be interrupted early due to coughing, then I roll quickly out of it again, sit up, finish coughing and resume the pose again and again until it is stable. As a counter pose, I use the fish in its easy form, followed by a resting pose, such as the crocodile or the hare. In my opinion, these exercises are far more effective – at least as far as I am concerned – than both traditional and modern lung therapy. The back is massaged and mucus is loosened. In general, sarvangasana helps in coughing up the mucus. An asthmatic mostly breathes with the upper part of the lungs. The chin lock forces one to breathe with the stomach and the pressure upon the diaphragm eases exhalation. In the long run, the lungs function better, supplemented, of course, by other yoga exercises and especially breathing exercises. The following account is testimony to that even deep seated muscular tensions can be resolved by shoulderstand. We have heard from our school in Bergen, Norway, of people who have received injuries to the neck and throat as a result of a car driving into the back of their own car. First the head is thrown backwards with great force, and then thrown forwards. After being the victim of such an accident, one is prone to lock in the pain by creating tensions in the muscles of the neck and head, and consequently it becomes chronic – the pain can be so intense, that it is impossible to work. Though it is not always visible on an X-ray. Years ago, people suffering this injury were not taken seriously by the authorities. However, that has changed. Now, victims of whiplash receive an invalid pension. Here is an example where a woman with this injury came to yoga classes. She started like everybody else with a beginners program of small easy exercises from pawanmuktasana (see, Yoga and the finer energy). To loosen the tensions, she used especially, and with great care, the warm up exercises for the neck and throat before head rolling, and head rolling itself. This gave a noticeable improvement, but the pain and headaches persisted. At the end of winter, the class she was in reached that stage where they were able to use the classical programme with the shoulderstand and plough. In the beginning, she found the two poses agonizing to be in, but after using them for a short period, she managed to relax the tensions completely and the pain disappeared. “I feel like a new person”, was her surprised comment. Children and adolescents in puberty should not do shoulderstand in the way we use it in yoga, where we stay in it for extended periods. While the thyroid gland is developing it should be left in peace. When the thyroid gland is completely developed, one can begin to use shoulderstand. As far as we know, this is the only yoga pose with limitations concerning children. Shoulderstand can be learnt quite quickly by most people, also by those who cannot as yet, do the headstand. If one is in doubt as to whether it is advisable to do shoulderstand, then ask a qualified yoga teacher. Also, seek advice if you suffer from a swollen thyroid gland, high blood pressure or a weak heart. Shoulderstand keeps the body vital and healthy, especially considering its effect on the back, where the tissue around the nerves and at the nerve ends are abundantly supplied with blood. The spine is the yogi’s main instrument; it is not just the nerve channels governing the body that are found here, but also the principal energy currents (nadis) and four of the nine main psychic centers (chakras). Therefore, one strives to keep the back healthy and free of tensions and blockages. This implies, among other things, that when you use the yoga exercises regularly, you will not encounter a great lack of energy – or unexpected and disharmonious experiences of a sudden increase of energy. The fundamental aim of yoga is to support a harmonious evolution of man, that does not happen in unexpected jerks, caused by the whims of nature or outer influences and stimuli, but as a steady growth. Shoulderstand can be done once or several times a day, but wait, as with all other yoga practices, until four hours after a large meal.